Back in the days before contacting your overseas friends was a moment away by e-mail, we had air mail. You wrote on one side of a piece of very thin paper and then folded it over itself to show the envelope side of the paper. The idea was to minimize the weight for transporting by air. Those envelopes were usually made from Onion Skin paper, a very light weight, but strong and durable, paper. It is made with a high percentage of cotton fibers, not wood pulp. It is an almost translucent paper and crisp to the touch like the outer skins of an onion, hence the name. A light strong, thin paper is not only useful for this airborne way of communicating but also for thick books such as the bible and the complete and unabridged version of the Oxford English Dictionary. 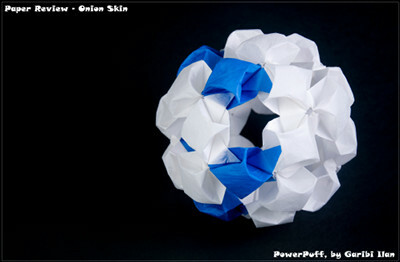 While researching the manufacturing of Onion Skin, the secret of the crumples in the Crumpled Paper was also unraveled. 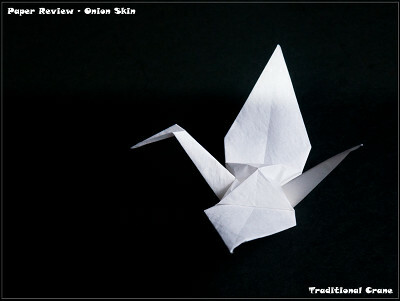 From Wikipedia: "The finish of onion skin paper is usually cockled, since it was air dried while it was being made. Cockled paper has a slightly wavy, handmade feel to it, along with a mildly dimpled finish. This property means that onion skin paper often crackles while it is being handled, as the sheets do not lie flat against each other. It also prevents leaves of onion skin paper from sticking to each other or other surfaces, a common problem with very light weight papers." We got our stock of Onion Skin paper 4 years ago in a dusty warehouse in Jerusalem, at a bargain price of 100 USD for a pack of 500 sheets. The manufacturer of this particular brand of Onion Skin is the Barcino Paper Mill from Spain. You are unlikely to find this specific brand in your local paper store, but there are many other producers who still make this paper. So, light and thin sounds like a perfect starting point for an origami paper, doesn't it? Here are the results of our tests. Thickness: The weight is 35gsm. The thickness is 46 microns, the thinnest paper we have tested so far. For comparison, Kraft is 48 to 53 microns, and Japanese Foil is 52 microns. Sizes: The usual size is letter or A4. We got a unique size of full sheet - 84.5×64.4cm. Colors: White, and only white. Paper Coloring or Colorability: Applying water color (by Ecoline) gives good results, but you have to be careful to spread it evenly. After drying there is no shrinkage at all and the paper becomes stiffer, easier to fold. Check the Powerpuff blue units to see an example. Texture: Cockled paper is the perfect term. It's like the Crumpled paper, but the bumps are more subtle and they have a direction - with more length than width. The paper is semi-transparent and has a visible water mark. As always with white paper, playing with light and shadow with a back light gives interesting effects. This paper, being semi-transparent is even more impressive. Photogenic: It is a white paper. I like the unevenness of the surface with animal models, since its more skin like. Images with back light or in black and white emphasize its beauty. Aging and Wear and Tear: My first ever pegasus was made from this paper, as well as the Unicorn and the Smilodon, both by Kamiya. All three are still standing, firm and stable, on all four legs. The color hasn't faded, the white is just as it was on day one, almost 4 years ago. The tear machine gave slightly better results than for the Test Kraft, staying true to its reputation as a durable and strong paper. Memory: Good. Make a crease and it will stay. Flatting the paper after a crease, there is a visible line, but you can not feel it with your finger, there is no evident bump. 8 out of 10. Forgiveness: Fair. Like Crumpled Paper, when you try to reverse a fold it's hard to feel the fold line on the other side. It's almost like guessing it is there. It's easier to reverse a fold line against the fibers direction, as expected. 5 out of 10. Tensile Strength: We refer here to the maximum stress the paper can undergo while being stretched or pulled. Tested by the machine, the value for this paper is 1.5 Kg, against the grain, with 4 mm stretch. With the grain, the weight it can hold before tearing apart is 4 Kg, and it stretched by 10 mm! Although the tensile strength is similar to Kraft, the stretch numbers are much higher, since it is made from cotton fibers, which are far more elastic than the wood pulp used for Kraft. 8.5 out of 10. Bending Resistance: This section rates the amount of force you need to apply to get a sharp crease and how strong the paper is while being curved (like during the puffing of the PowerPuff unit). Curving is not a strong feature. Trying to keep the Powerpuff modules puffed gave unsatisfying results. A sharp crease can be achieved easily with your finger nails. 5 out of 10. Where to buy: I do not know the address of this paper warehouse in Jerusalem, but since we bought the only package he had, it doesn't really matter. Being mainly for office use, many retailers sell it in the A4 proportion. Just Google for it, to find a store near you. As always with thin papers, the result is very sharp. But it's a crisp paper so when I pulled the wings apart, the center did not curve gently, but broke into uneven surfaces. 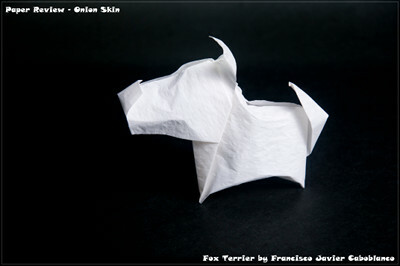 Pushing the back of the dog's head demonstrated the paper's high elasticity. The bird will flap for hours with no sign of fatigue or weakness. The frog did not jump very high. The paper isn't springy enough. Being half translucent and white, back light emphasizes its beauty. 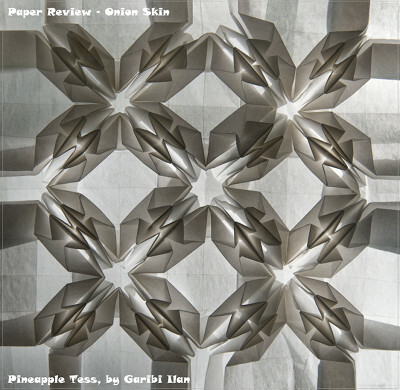 During the grid phase, this paper reminded me of the thin Kraft paper from the previous review. It's hard to find and reverse the crease lines that go with the grain. Unlike the Kraft, the crease lines on the Onion Skin are hardly visible, which makes the next phase - the pre creasing - not an easy task to complete. The collapse was fairly good, since the paper is crisp and has some bending resistance despite its thinness. The final result looks elegant and clean. The back-lit image shows the grace of the white paper. A simple method that creates organic forms benefits most from this paper's properties. Since the Pineapple tessellation demonstrates the back light effect, I chose this tessellation to replace the Mystery tessellation. It was created for someone who wanted to present a beautiful antique ring in a jewelry exhibition and she found it as a perfect background. It is made by a very simple procedure of folding back and forth one line on two. This paper is perfect for this method. On a 22cm paper I made a grid of 64, with no particular problems. Folding was easy even with many layers that accumulated in the center, due to its thinness. The old model on the left shows how well this paper ages after almost 4 years. 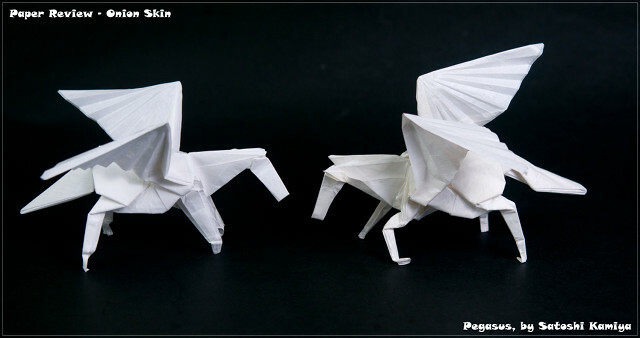 My first try of the Pegasus was 4 years ago with this paper. 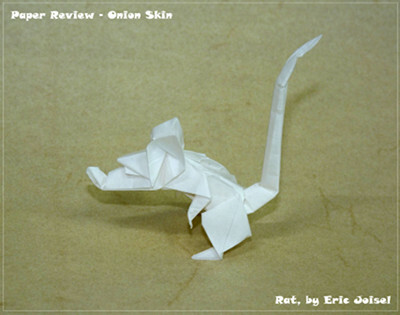 I re-folded it for this review. I must say it went very well. Forming the base was easy, open sinking stage 37 slowed me down but only a little, and the zig zag in the wings could be folded with high density. I compared both old and new models, and the only difference is a yellowish color resulting from some MC I applied on the older model. The cockled texture improves the appearance of the final model. This thin paper really needed another complex model. Box pleating the body went extremely well, similarly for the wing tips. The talons require gentle, accurate reverse folding and shaping, stretching my abilities but not the paper's. The cockled texture gives a lovely finish to the model. Colored units are easier to fold and shape. Preparing the squares with an Envelopener caused some tears in the edges, since this paper is bumpy, or crumpled. Inside-reverse folds are difficult, and you need to fold it again on the other side to make it reverse correctly The 5 units I colored behaved much better, and reversing their folds was much easier. Puffing was not fun at all. It was difficult to get the shaping of the rounded parts and the inner flaps tended to open up again and again. Connection was a disaster. The paper is soft and I couldn't connect the units without the benefits of, well, glue. But glue raised another problem - if the paper gets wet, it curls quickly and becomes even softer. I had to put a tiny point of glue to avoid that problem. The final result is very airy and worth all the effort. A great paper for multi-layered models. The paper is great for multi-layered models. Being so thin, it is easy to fold many layers. On the other hand, since it is a smooth paper, the layers tend to slip one on the other, so it is wise to pre crease each layer before. The final result is very satisfying but the paper is too weak to hold its weight. Apply as little as possible water to allow quick molding. All went well, until the last step, going 3D. The model spread its legs wide, and nothing could hold them back. I sprayed some water and the paper sucked it all and become highly flexible; too much to be molded nicely. On the other hand, it dries very quickly and the final posture is very stable. This paper is not for wet folding, but to shape here and there it is great. 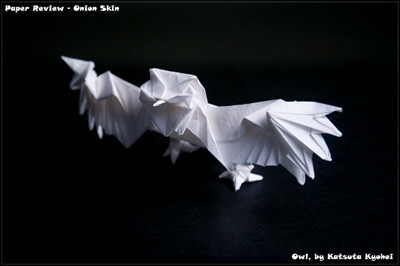 This one sheet model benefit from the thinness of Onion Skin paper. The classic Omega Star is a modular, but not Montroll's version. 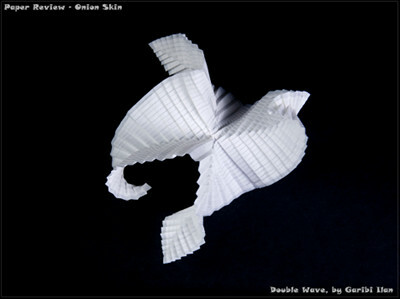 This model is made from one sheet, and requires a thin paper making Onion Skin a perfect candidate. I was not disappointed. Folding went well, and the final result is nice, although the spikes are not as sharp and straight as I wanted them to be. 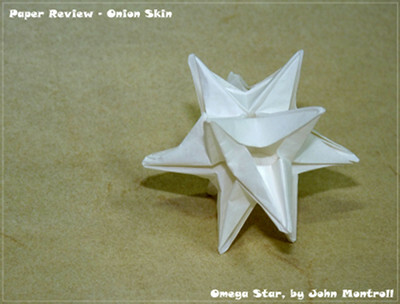 Four years ago, and with very little knowledge on paper, I disliked Onion Skin. It was too crisp, hard to reverse fold, and easy to tear by an accidental move of a sharp finger nail. Today, older and wiser, with many paper types and brands in my paper collection I can say it is one of the best thin papers I have. But you have to choose your project wisely. For complex models it is great - it's thin, durable and will stay for many years in your display cabinet. I wouldn't use it for modulars, and for tessellation I will chose complex ones, or such that have very little flat surfaces between the molecules, to avoid that crumpled look. I found it perfect for Goran Konjevod's organic collection of models. Being so thin it is absolutely not for wet folding, but for shaping here and there - it's great. For traditional, simple models it will work just fine, much better than Printer paper, with less problems of aging, or losing its whiteness during the years. 3D models need the help of a tiny amount of moisture here and there. Coloring the paper makes it even better, giving some extra crispness for folds that go along the grain. In flickr - almost nobody uses it or cares to state that they do. I found only 4 beautiful back-lit stars made by gailprentice, and my own models. Bottom line: nostalgia has its benefits! These reviews are awesome and helped me learn alot about different types of papers. Do you know if they sell these varieties in Arts and craft stores?